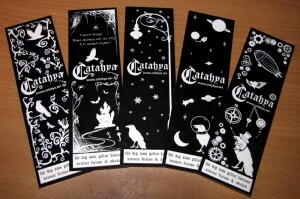 A while back I did these bookmarks for Catahya. They’re meant to represent different genres that falls beneath the Catahya raven’s wings of protection. First out is a classical fairytale theme with briars. Then we have the spooky horror bookmark followed by a raven in the snow that doesn’t have a genre really, but lampposts in the snow is very much Narnia to me so maybe it can be the average fantasy mark. The forth bookmark is set out in space and represents sci-fi. No questions there, I’m sure. And then the last one which is a steampunk mark. I don’t really know if it’s a big genre or not, but I really wanted to make something steampunkish. 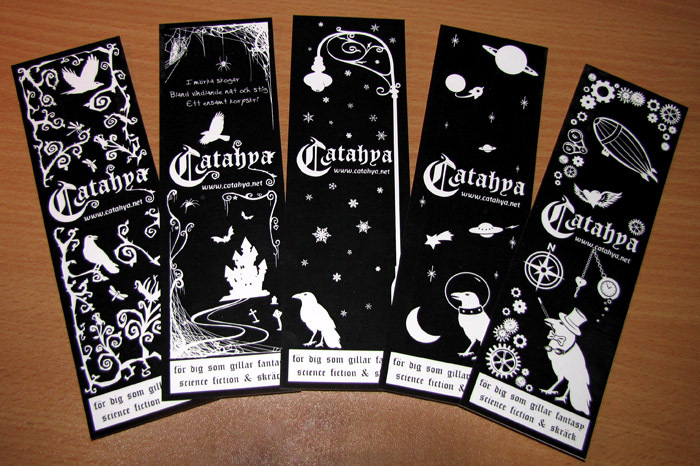 Catahya will use the bookmarks as marketing and a bunch have already ended up in libraries here and there in the country. That’s neat.